Last year, there was said to be an all-out “war on wasps” in many areas of the country, mostly believed to be the result of climate change, as the stinging insects normally die off during the winter, but when there aren’t enough freezing cold days, they survive. The warmer weather also gives the queen’s first broods a better chance of survival. The colonies are bigger than ever, which means the wasps are hungry and more aggressive than ever too. Wasps may even attack, typically as a response to a particular chemical given off by other members of their hive. That’s why you should never swat or squash a wasp – when you do, the pheromone that’s released will only attract and invite more wasps that are nearby to come. Although wasps can be of use around the garden by consuming dead insects and eating flies, they can be a big nuisance themselves. Apart from stinging, their persistence can be irritating and present a serious threat to those who are allergic. The term wasp refers to any insect of the order Hymenoptera and suborder Apocrita, which is neither an ant or a bee. The most commonly known types of wasps are hornets and yellowjackets. While wasps can be invaluable for natural pest control, their potential to injure makes them something most people want to get rid of if they’ve decided to take residence on their property, making their own yard a dangerous place to relax. But before you turn to chemical treatments, realize that chemical management of wasps and wasp nests is difficult and dangerous to attempt. Using said chemicals can also harm the health of you and your family, as well as your pets and the environment. They can be particularly hazardous to children, as Maryland’s Department of Agriculture reports that data collected from the American Association of Poison Control Centers showed that in 1993 alone, an estimated 80,000 children were involved in common household pesticide-related poisonings or exposures in the United States. Instead of risking the dangers, consider these natural ways of getting rid of those annoying wasps. Prevention is always the first step in keeping wasps out of your home and yard. Wasps buzz in and out of people’s yards and decide to form nests in any opportune spots your home might provide. Keep them away by removing any unwanted food, and covering trash cans. Think about anything and everything they may be attracted to, which includes pet food and even bird food. Keep in mind that things that are sweet, attract wasps, which includes nectar as well as perfumes and lotions. It’s also to important to maintain the structure of your home and its fixtures by walking around it and checking for any areas that need repair. If there is broken siding or panels, or any other types of crevices, they make ideal places for a wasp to build her nest. Be sure that all of your screens, windows and doors are in proper working order so that those unwanted insects can’t fly in. Check around your yard too, searching for rodent holes and potential burrows that could make a perfect home for wasps. Fill up the hole with dirt so they can’t use it. Decorative wasp decoys can help too. They can be purchased at most home improvement or garden stores, or from this page on Amazon. They’re especially effective for paper wasps, which are territorial and generally won’t build a nest that’s within 200 feet of another one. Placing a couple of decoys, one on each side of the house, can deter them from moving in. If you don’t want to buy them, you can make your own and it requires zero crafty skills. Simply crumble up some old newspaper into balls, stuff them into plastic shopping bags and tie them closed. Stuff the bags into paper lunch-size bags, and hang them up in corners and other spots wasps may be likely to nest in around your yard. Taking a look and your landscaping by removing flowers from the places you like to hang out and adding some green plants into the mix can be a great way to deter wasps, as plants like spearmint, thyme, citronella, eucalyptus, and wormwood serve as natural wasp deterrents. Grow them in your yard or garden in an area you’d like to enjoy wasp-free. In addition to their ability to chase the insects away, they naturally add beauty and fragrance. Not only do wasps stay away from spearmint, they don’t seem to like any type of mint, which is why peppermint oil can be so effective at repelling them. A study published in the Journal of Pest Management Science in 2013, reported outstanding results with peppermint oil. In addition to planting any type of mint in your garden, you can simply add a few drops of peppermint oil (such as this Plant Therapy Essential Oils Peppermint Oil) to a cotton pad and place them strategically around the outside of your home where wasps like to build nests, such as porch roofs, under eaves and other crevices and ledges. Target spots where you’ve discovered old nests in the past and some types of wasps build new tests in the same locations again and again. 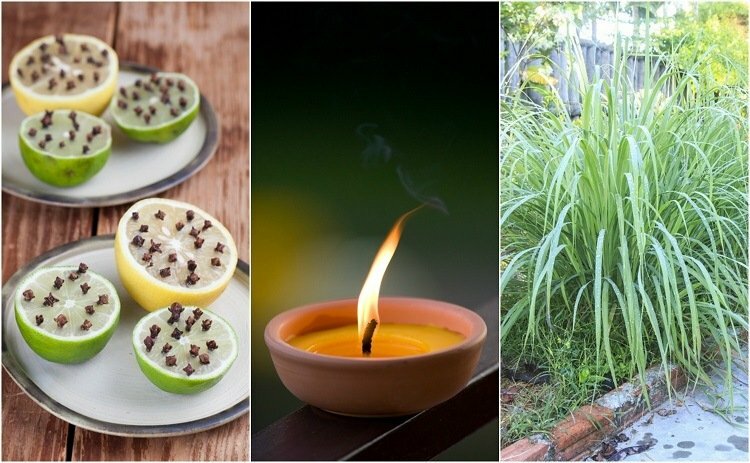 The same research referenced above, also found that a blend of lemongrass, clove and geranium essential oils managed to completely repel worker wasps. You might try apply a mix of several drops of each of the oils in a spray bottle filled with water, and a few squirts of dish soap. Coat the areas outside of your house, as before, in places wasps are known to build nests, to keep them away. These traps work by attracting wasps to fly inside a container that offers a tempting treat like sugar water, but they aren’t able to escape once they make their way in. You don’t need to buy them, you can make your own in just minutes by cutting the top from a two-liter bottle and inverting it inside the bottom. 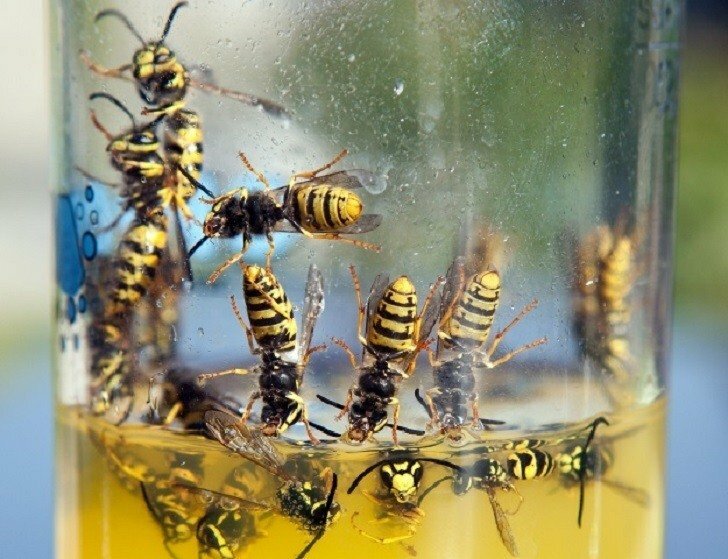 Once the wasps go in the bottle they can’t figure out how to get out so they get trapped and die. Cut the neck off a two-liter plastic pop bottle. Remove the bottle cap and flip the neck upside down and place it in the bottle opening that you just cut. Tape it together using packing tape or duct tape. Bait the trap by placing a mix of water and sugar inside. You can also use soda, beer, water and vinegar or even laundry soap. By adding a bit of cooking oil along the steep edges of your trap, it can cause the wasps to lose their footing and fall in. Hang your trap by taping a string to it, or affixing a screw that can be used to hang it. When you’re ready to empty your trap, be sure all wasps inside are dead by pouring in boiling water – or, you can simply throw it out and make a new one. The only downside to using traps like this is that it’s unlikely to totally resolve your problem, as you’ll probably capture wasps that are just passing through your yard, rather than only the wasps that belong to the problem nest. You can help increase the odds of success by locating the trap near the nest close to its entrance. IMPORTANT: Removing wasp nests can be very dangerous. It is strongly recommended to hire an experienced professional to do the job for you. If attempting yourself, first ensure you are not allergic to wasp stings by setting up an allergy test with your doctor. Ensure that you wear protective clothing at all times and plan an escape route should the wasps decide to swarm. An eco-friendly way to remove wasps that have already housed themselves on your property is to use plain soap and water. Add two tablespoons of dish soap to a spray bottle filled with water, and spray away, directing it at small hanging nests Experts say the soap works to clog their breathing spores and they die almost instantly. It’s a lot more humane than using pesticides to kill them, as those chemicals can take hours to work. If you’ve got large nests, you may want to tackle them with a garden hose. Just attach the hose-end sprayer and fill it up with the same solution of water and dish soap. As this technique can be quite a bit messier and could increase the risk of getting stung, be sure to stand as far back away from the nest that you can, and wear protective clothing too. Let the hose run for a few seconds to get it going, and then totally douse the nest with the soapy water. If there are any wasps that survive, they won’t stick around – they’ll take off to avoid risking harm and build a new nest somewhere else. You can get rid of aerial nests and their wasps by drowning them, but it’s important to be sure you aren’t allergic to them first, as this method comes with some risk of getting stung. If you have an allergy, a sting can be life threatening, so give this job to a professional or someone else. Either way, protective clothing like long pants, socks, boots, a hooded sweatshirt with the hood pulled over your head, gloves and protective goggles or glasses is a must. Also keep in mind that this is a job that’s best done at night because that’s when the wasps are least active, so their reaction time is slower, and they are less aggressive. Use a red or amber colored light for safe visibility as standard flashlights will attract wasps to you. Carefully place a cloth bag over the entire nest, and then quickly tie it off at the top. As you draw in the tie, pull the nest free and the bag should be well-sealed. Now, set the bag in a bucket of water, and drop a large rock on the bag so that it stays totally submerged. If you have wasp nests in the walls or your home, or underground, it’s best to turn to a professional. Another option, which also calls for the protective measures mentioned above, is to use smoke. You can light a fire in a grill just below the nest, or build a small fire underneath it. The smoke will rise up and seep into the nest, where it will suffocate the wasps and force them to evacuate. Allow the smoke to rise for an hour or two, and when you’re 100 percent certain the nest is empty, put the fire out and then knock the nest down using a stick or other object. It’s a good idea to keep a spray bottle filled with dish soap and water nearby so you can use it to fend off any live wasps that might remain. This technique only works on aerial nests which are hanging from tree branches or other exposed areas – don’t use it on nests that are anywhere near your home, such as in doorways or under eaves, as you could accidentally set it on fire.